Book six in my challenge to read one book (I haven’t read before) a fortnight in 2012 is Catching Fire by Suzanne Collins, the second book in The Hunger Games trilogy. Katniss Everdeen’s story, started in The Hunger Games, continues in Catching Fire. Having overcome the Capitol once, Katniss is now faced with doing so again. Back home and living the life of a victor, Katniss is unsatisfied, feeling trapped and fearful in the knowledge that President Snow is unhappy with her. 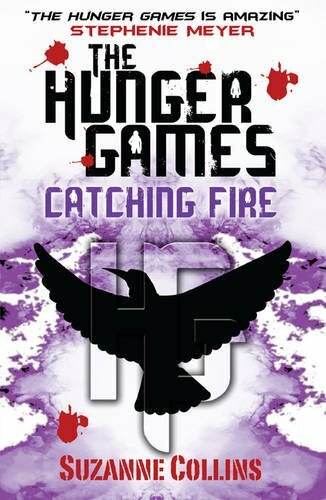 Rather than this just be a book about Katniss and her close friends and family, Catching Fire starts to spread out into the larger world of the Capitol and the 12 districts. As Katniss and Peeta – still pretending to be lovers, Peeta wanting it to be so and Katniss just unsure – make their victory tour round the districts, they discover all is not happy. The districts are showing signs of rising up against the Capitol, and the Capitol knows only one way to punish Katniss for sparking the uprising – put her back in another Hunger Games. It takes half of Catching Fire for us to get to the stage of another Hunger Games being announced, when it could have taken half the time. Still, when we get there it’s worth the wait. The 75th Hunger Games, a Quarter Quell, feature previous victors as competitors. Here, we get to meet some new characters, and some really interesting ones. I particularly love Finnick, who I think has an interesting background, one I hope to find out more about. Peeta continues to be a compelling character. He’s so good, and that could be so boring, but it’s actually refreshing to meet a character who always strives to do the best. In fact, his one fault is that he is too selfless. There’s something a bit strange going on in the Quarter Quell, and it takes Katniss much, much longer than it takes the reader to work out what it is. In fact, Katniss never works it out, it takes Haymitch telling her right at the end to make her see that she is the Mockingbird that is her symbol, that she is the spark for a total revolution, not just some small uprisings in the districts. In a way, I find it difficult to believe that moody teenager Katniss is the inspiration for a revolution, but in another way it makes perfect sense. It’s not Katniss who is the inspiration, it’s everything she stands for – dissatisfaction, rebellion, an anger at the Capitol. I found it a little difficult to picture the arena for this Hunger Games in my head, but once I’d read it again, I thought it was a really clever tool from Collins. Time is a powerful metaphor, and the tick tock of the clock becomes more ominous as the book continues because it refers not just to the arena, but to something much more important. Catching Fire is not as good as The Hunger Games, and it’s really one long build-up to the third book in the trilogy, Mockingbird. But it sets an interesting stage for book three, where the arena is no doubt about to get a lot bigger than those used in the Hunger Games.